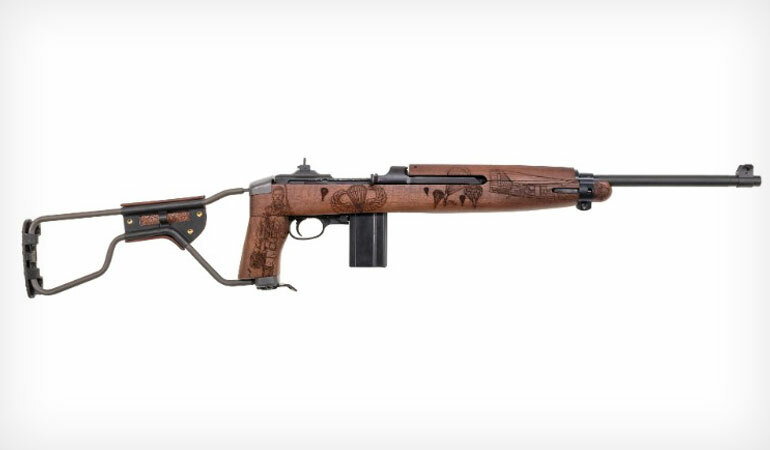 Thompson Auto-Ordnance, maker of the "Tommy Gun" and other classic firearms throughout history, introduces the "Airborne" M1 Carbine. Saint Michael is the patron of many heroic professionals, included amongst them paratroopers. These brave members of America’s elite airborne units step into the unknown with every jump. Each time not knowing what enemy lays below or even if they will make it to the ground and the battle that awaits. Kahr Firearms Group pays tribute to the brave airborne warriors of WWII, with this custom laser engraved version of our paratrooper M1 Carbine. On the forearm is the battle-worn American flag. Adjacent is St. Michael, with the text “St. Michael pray for us”. A paratrooper, parachutes, and detailed C-47 transport aircraft are engraved on the opposite side. The stock is an authentic reproduction of the original folding version issued to airborne soldiers. As with all Auto-Ordnance M1 Carbines, the wood is high quality walnut, and all metal parts are Parkerized. It is an accurate, reliable, easy to shoot rifle in soft recoiling .30 Carbine. This WWII commemorative continues the Auto-Ordnance tradition of providing high quality reproductions of American military firearms for today’s shooter. The “Airborne" M1 Carbine (AOM150C1) has an 18” barrel, walnut folding stock and wood handguard. It has a blade front sight and flip-style rear sight. MSRP is $1,518 and comes with a 15-round magazine. Contact your local firearms dealer to purchase. 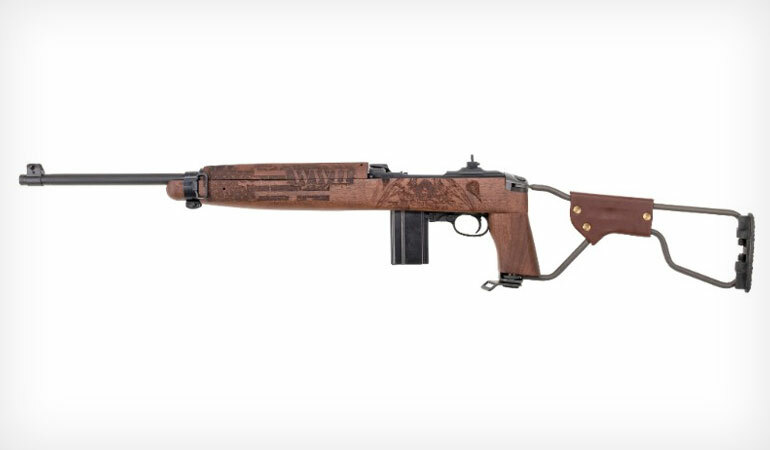 The "Airborne" M1 Carbine is now shipping. Kahr Firearms Group and Outlaw Ordnance worked closely together on the “Airborne” M1 Carbine and other custom projects. Outlaw Ordnance, based out of West Monroe, Louisiana, is a growing firm, changing the firearm industry with custom designs and innovations.